According to the University of Florida newspaper, The Alligator, “Hello Kitty stickers are part of the latest danger to police officers nationwide“. 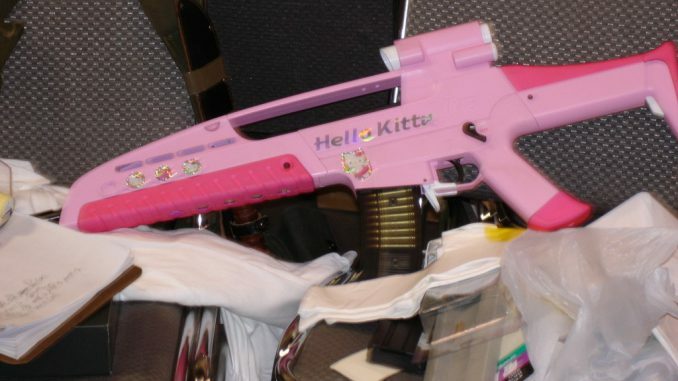 That’s right, the Gainsville police department is scared shitless of the Hello Kitty rifle. Quote from the Brady Bunch – big shock there, huh? “Can you imagine a child finding a pastel blue or pink Glock, fully loaded?” the release stated. So they have never actually seen a painted gun, yet is is a growing concern and threat to them. Perhaps they should worry a little more about a criminal with a $100 steet purchased glock stuffed down his shorts and a little less about law-abiding gun enthusiasts that would take the time and money to create custom, one-off designer paint jobs that cost hundreds of dollars. Now that Editor’s note made it sound like I was mass producing guns that look like toys for sale on the open market. A couple more rounds of emails and comments and they then replaced it with the following: “Editors Note: As per a request from the person who made the Hello Kitty rifle, we have taken down the image.” Well, at least they finally got the editor’s note right, but in another blatant attempt to silence any opinions that differ from their own, the proceeded to delete all the newly posted comments again. It looks like the University of Florida newspaper, the independent florida alligator is a little fast and loose with the facts, supports censorship, and is willing to print any one-sided propoganda piece without concern for the truth or doing any investigative journalism on their own. Feel free to tell them how you feel about this.